Robert Scoble presented an afternoon briefing at the annual IT@Cork Conference that set new standards. Scoble melds a fact-laced presentation with a crowd-warming back channel that is political as it is technical. Scoble worked the Rochestown Park Hotel bar crowd as effortlessly as Bertie Ahern works Kennedy's pub in Drumcondra. Quick-witted, enthusiastic and unhesitant, Scoble responded to a rapid-fire sequence of questions, affirmations, speculations and accusations. You couldn't help but think that his parent company was as human as he has proved to be during his extended stay in Ireland. For the third level Irish students absorbing the Scoble Effect as part of their college public relations module, this was an afternoon with the Master himself. I doubt that they will ever encounter such a telegenic personality without visiting the Vatican. The big difference is that you have to pay for your pints in Italy. 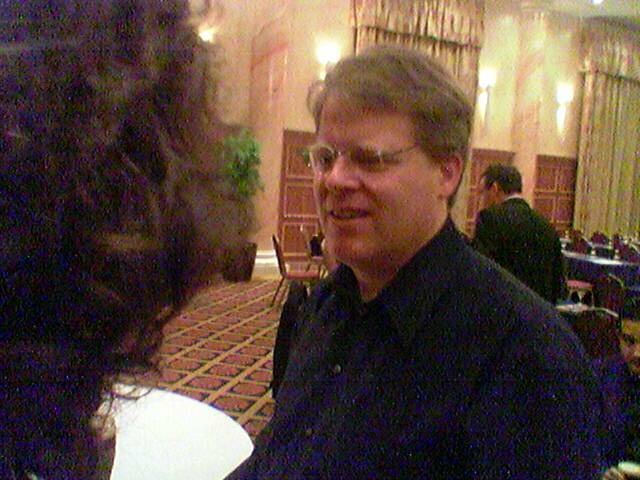 Around Scoble, the Man Himself gave the day a special buzz. 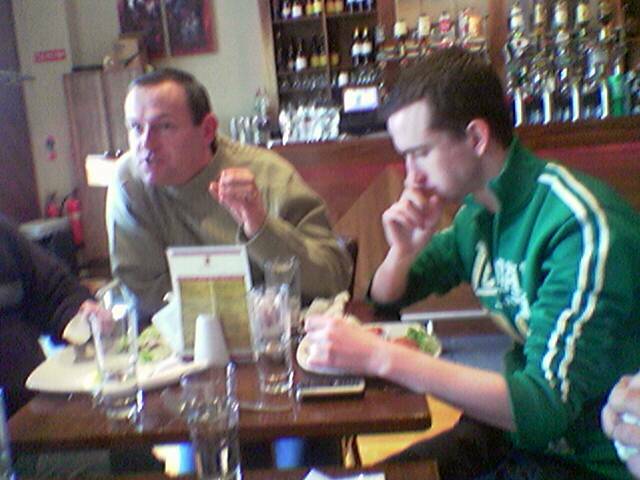 Fuzzy image snapped of Scoble mingling at Rochestown, Cork, Ireland. Better images from "ITCork" on Flickr. James Corbett -- "Robert Scoble: Distributed Celebrity"
Niall O'Brien -- "Robert Scoble in Cork"
Big Thanks to Tom Raftery for organising the Scoble appearance. IN CORK annual IT Comference, we parked ourselves in Barry's in Douglas for a tabletop discussion about multimedia projects. Each student gave an impromptu presentation of their third or fourth year project. John Stanley served as the sounding board for each presentation. We were finished after 13 bowls of potato soup and seven ham sandwiches. Now it's back to Scoble in Cork. Image of working lunch and blog item sent via Nokia 9500 O2 Typepad service. Better images in Flickr photostream. WE ARE UNDERWAY TO the Technical Forum at the Annual IT Conference in Cork, an event featuring Robert Scoble and a bunch of interesting people on the side. 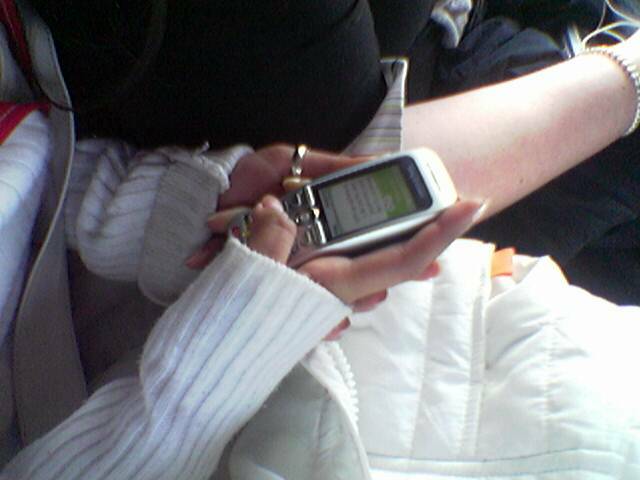 You can't live without texting if you live in Ireland and that's what the picture of Neha Gupta texting away in the back seat of Corsa #1 shows. The order of the day: lunch at Barry's in Douglas, afternoon in Rochestown Park Hotel, then a quick stop at the Thirsty Scholar before heading over to the Irish Geek Dinner in Proby's Bistro at 8PM. Mail2blog and photo of texting snapped and sent with Nokia 9500. WHILE HEADED TO CORK for the Annual IT Conference with 10 college students, one topic of discussion focused on The Main Man Robert Scoble. Is his drawing power grounded in his celebrity status or is there something else at work? The students will be attending both the Technical Session where Scoble talks about blogging for business and the obligatory Irish Geek Dinner where 30 bloggers plan to meet up in Proby's Bistro. Both of these events have a celebratory dimension to them. Both have a celebrity factor at work too. Disclosure: The frantic labour effort expended on finishing our new house in time for Christmas will succeed on the back of Polish, Romanian, Russian and Latvian workers--all supervised by an Irish site crew. The day crew doesn't wear work permits on their overalls. IF MY CHRISTMAS stocking was big enough, I would like to find a Finepix S9500 digital camera in it. I have its grandfather, the S602Z, in my sling sack. It cost $800 when I bought it. I believe I can get the S9500 for that same cost on a trip to NYC. In Ireland, Sam McCauley offers the Finepix S9500 for €649. The camera delivers 9m pixels on images which is 50% more per snap than the S602Z gives me. Better still, the S9500 comes with a 28-300mm lens. I know what my macro images would look like through that lens. The videos could be shot farther away as well. THE ECONOMIST'S "Special Report" last week talked about Microsoft's move "way beyond the PC". Xbox 360 "highlights Microsoft's march into new markets".... "It is all a far cry from Microsoft's typical fare. There was no mention of installers, security patches, service packs, server protocols, operating-system monopolies or consent decrees. And that is precisely the point. The Xbox 360, which will be launched in Europe and Asia next month with an enormous marketing campaign, is the most visible example to date of Microsoft's march into new markets beyond its traditional business of making software for desktop and server computers." IT IS JUST a matter of time before the Irish arm of the RIAA discovers my treasure trove of mashups. We use bandwidth funded by the Irish government to store 50 different mashups that we use on a syllabus to develop a production aesthetic in three of the third level modules taught in the multimedia programming part of the BSc in Information Technology offered at Tipperary Institute. The RIAA, and its cousin the IRMA, doesn't appreciate mashups. One of my fav download zones, Mashup Town, took down its mashups after the RIAA complained to its hosting partner. I wonder if Ireland's Higher Education Authority has more backbone. COMSCORE NETWORKS cites a significant stat that shows yet another way that Ireland is slipping down the league connectivity table: More than 94 million people in the States, or 56 percent of the online U.S. population, have watched streaming video online. Over the last three months ending in June, the average consumer watched 73 minutes of online video a month. You need good broadband pipes to enjoy this kind of experience.